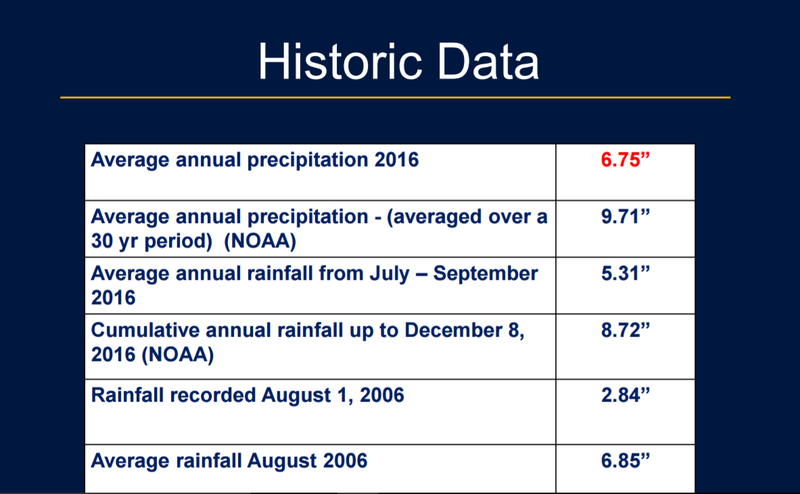 The first line tells us that the average annual rainfall in El Paso during 2016 was 6.75 inches. Average of what? Do they mean to tell council that 6.75 inches of rain fell in El Paso during 2016? Do they even read their presentations to council? This entry was posted on Thursday, April 6th, 2017 at 5:21 AM and is filed under City government. You can follow any responses to this entry through the RSS 2.0 feed. You can leave a response, or trackback from your own site. Looks ta me like a preview to raising the Rain water fee on yer water bill again. Ummm… it’s pretty obvious that they mean that as of 2016 the average annual rainfall (because we always have years and we always have rainfall) is 6.75″. If we had a bunch of years where the rainfall was 12″+ then that average would creep up every year. Likewise, if we had a drought for a bunch of years the average would creep down. If you’ve ever watched TV weather you’d know that its basic meteorology and this is also exactly how they end up with average high/low temperatures for any given day. Come on, there are plenty of legitimate things to criticize the city over. All you do with something like this is come across like a petty jerk who is just foaming at the mouth and looking for conspiracies under every rock and twig. While I won’t go as far as Chuco Nerd went, and call Brutus any names, I would point out that the inclusion of the year, 2016, simply means that this is the average rainfall taken from all the years that records have been kept, up through 2016. That’s all. That would be an average slide for city presentations. Or the very average IQ of the person who gave the presentation….